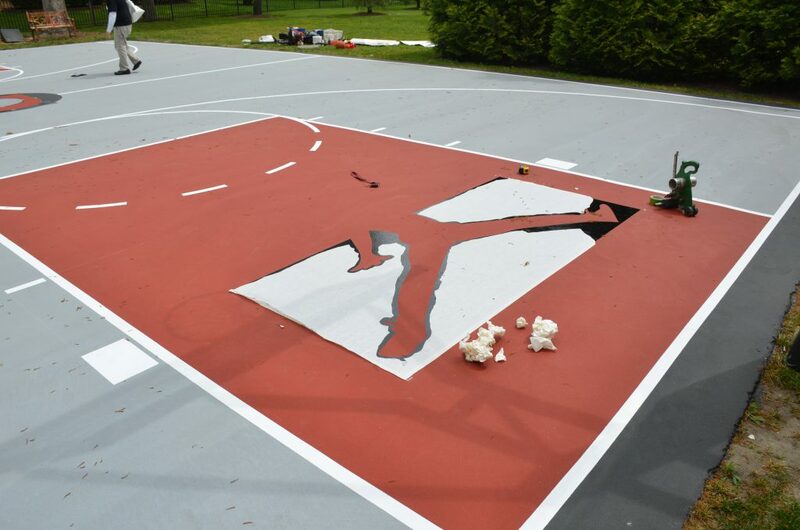 DeShayes Dream Courts designs and builds custom basketball courts all over the world. Some of the courts are standard and some of them are over the top. 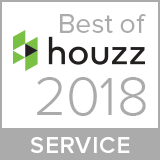 Whatever the client wants, DeShayes will make it happen. 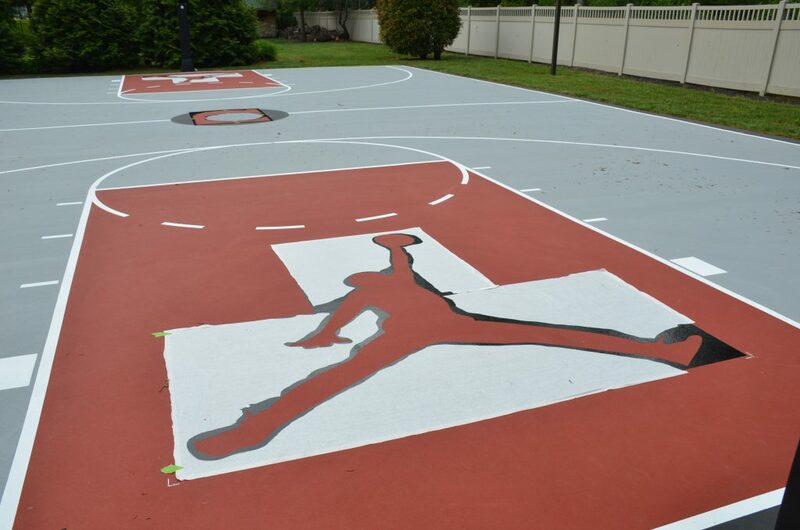 Often, clients want custom designs painted on their courts. They range from college basketball logos to family initials and everything in between. 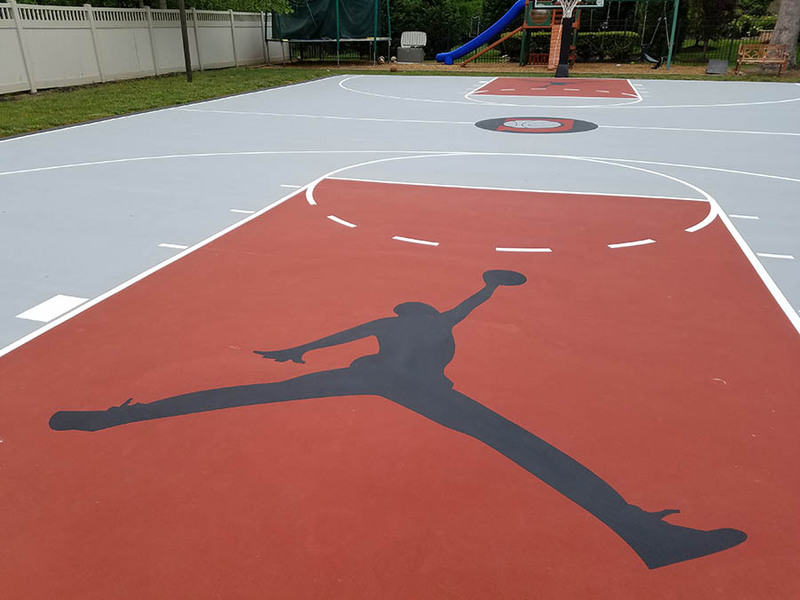 The most common design requested to be painted onto a DeShayes Dream Court is the Jump Man, which is similar to the silhouette of famous professional basketball player Michael Jordan performing a slam dunk. This symbol has become synonymous with basketball. Getting this symbol on a DeShayes Dream Court isn’t easy, there are multiple different steps involved, you can read about them below and get a better understanding of the process with the following pictures. 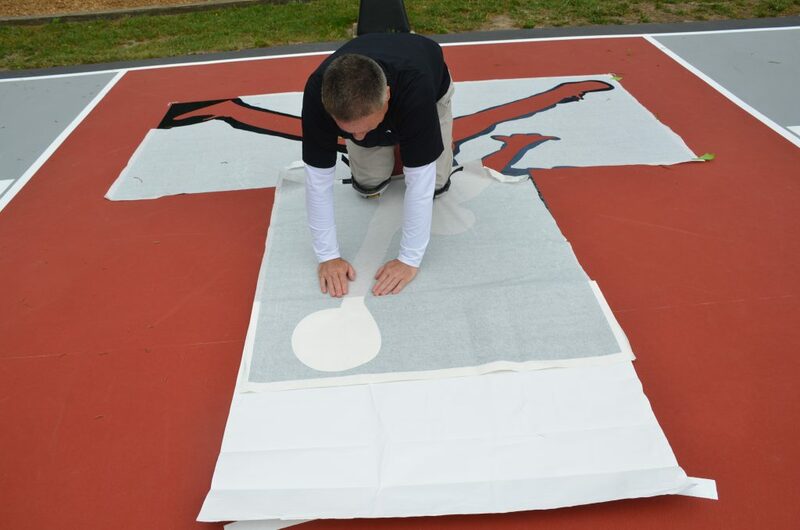 The first section of the 8’ 2-part stencil is applied to the court. The stencil is a one-time use vinyl stencil with a sticky back. The second part of the stencil is lined up with the first to match the body lines and applied to the court. 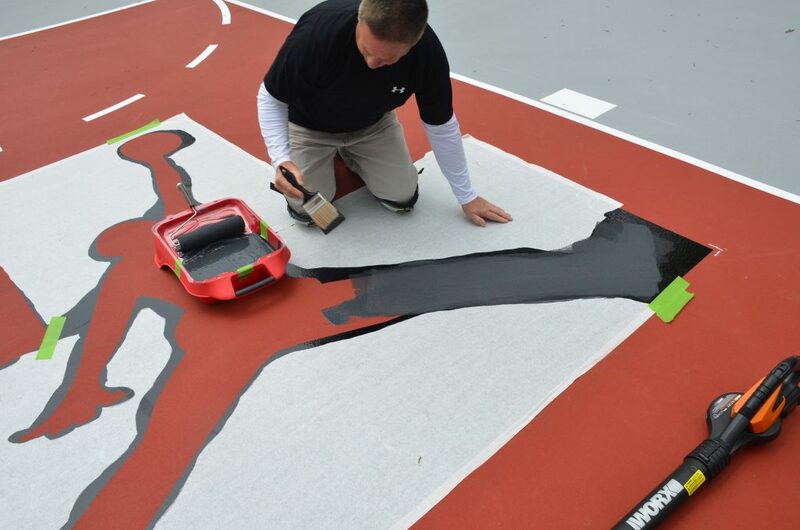 Once the stencil is fully attached to the court, it is rolled over with a rubber roller that is used to for line striping. This ensure proper adhesion and eliminates the potential for bleeding of the paint. The first coat of paint is applied to the court over the stencil. 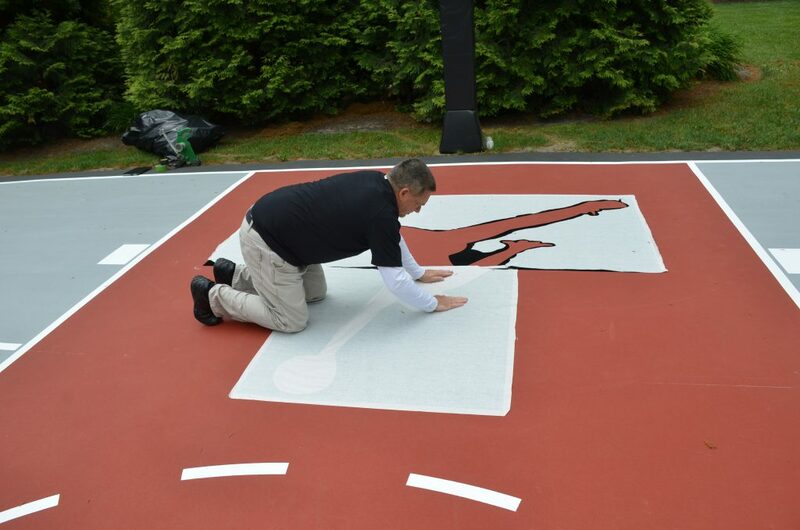 The stencil allows you to paint outside of the lines, so you don’t miss anything, but it is best to still try to paint in the area of the jump man to conserve paint. The second coat of paint is applied. It is imperative that you let the paint dry before pulling up the stencil to keep the lines crisp and the rest of court paint free. 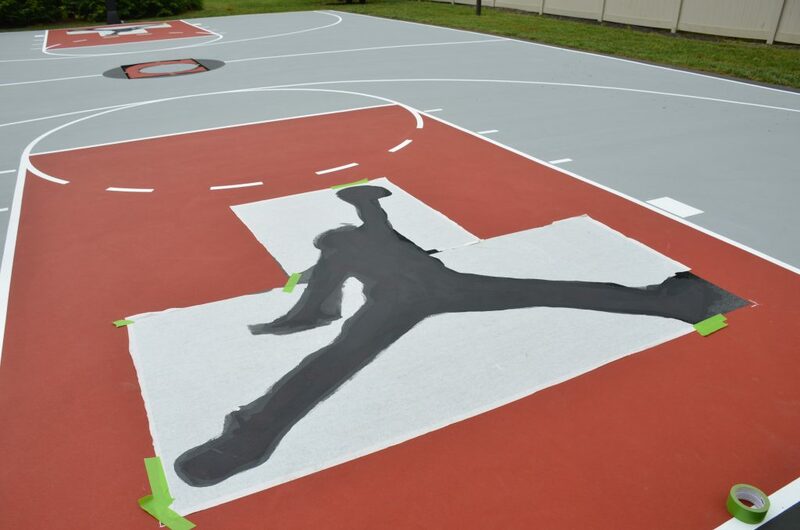 The 8’ jump man is in the lane of this basketball court is complete. 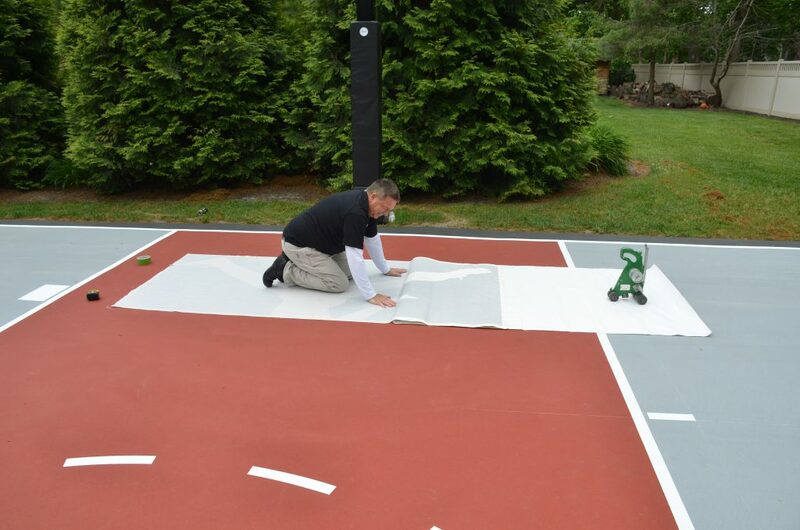 If you would like to learn more about adding artwork to your basketball court or would like a consultation on having a court installed, please don’t hesitate to contact DeShayes Dream Courts at 1-877-928-4653.